Kengtung is known for its trekking program and tribal villages of many colorful ethnic tribes which for decades have been untouched by tourism. The town has kept its centuries old traditions and many of the structures there are of the classic Shan design with colonial structures. You may combine this tour with other packages. Flight from Yangon to Kengtung. Upon your arrival in Kengtung, you will be transferred to New Kengtung. The city is known for its trekking program to villages of many colorful ethnic tribes which for decades have been untouched by tourism. In the afternoon, you tour of Kengtung, a pleasant city nestled in the mountain valley of Shan state which has retain most of its traditional Shan architectural grandeur. Visit Wan Pauk, a village of the red clothed Palaung tribe, famous for their silver and lacquered waistbands. A visit to the striking Maha Myat Muni Pagoda and hot spring is a must. Overnight at Hotel in Kyaing Tong. In the morning, stroll through the bustling local market and observe the peddling of wares by the minority hill tribes in their colorful traditional costumes. We will then bring you on a trek to Hwe Lon, an Akha minority village where you can interact with the villagers to learn their customs and habits. After lunch, discover the Ann minority tribe known for its black dress and teeth stained black from chewing betel nuts. A stop at Lone Tree Hill will offer you a panoramic view of Kengtung. Overnight in Kengtung. Today, we will take you on a further exploration of the hill tribes as we scale the rugged terrain on local pock-ups to four neighboring Akha villages, one of which combining three religions. In the afternoon, trips to Loi, Li Shaw and Khun villages in the Mong Kwan region will deepen your insight of these distinctive and rich hill tribe customs and traditions. Overnight in Kengtung. Enjoy the day at your own leisure. If possible, we will bring you to witness Shan lacquer ware production and the trading of buffaloes at the water buffalo market held twice weekly. Transfer to the Kengtung Airport for your departure flight to Yangon. You may combine this tour with other packages. 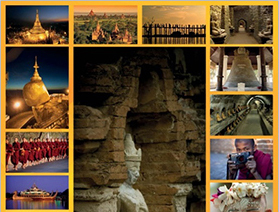 This private tour can be arranged for single traveler, couple, family and group tour. Prices vary according to hotel standard, when you travel, how many people you travel with, the level of private guiding required and the overall arrangements. Please contact us to discuss your individual requirements.